Construction workers have one job — building a structure. This is a process that is understandably very messy, and bound to leave quite a mess. Understandably, it’s not their job to clean everything up and make it shiny and spotless for people or businesses to move in. But that leaves a building owner like you in quite a predicament — what do you do about the mess? The answer is to call CleanPro for post-construction cleaning services! This is the big one. Dirt and dust get everywhere in a construction job. 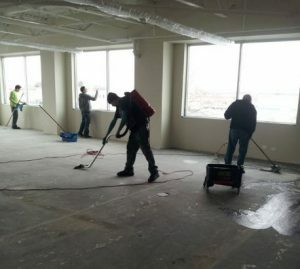 Flecks of drywall, sawdust, and dust penetrate virtually every nook and cranny of a newly built structure and it takes a copious amount of vacuuming with industrial equipment to truly clear it all away. While construction workers are generally good about clearing big stuff, you can bet there will still be debris lying around. Some of it is trivial to remove, but sometimes it’s a job much easier done with a professional team. Even if the common areas are spotless, untold amounts of dust settle into the vents during a construction job. If these aren’t extensively cleaned, your air quality will suffer. Trust us when we say this isn’t an easy job to do alone! A lot of little details are often forgotten in post-construction cleaning, such as fan blades, light fixtures, appliances, and more. We’ll make sure your building truly feels new. If you’re a business owner, a sustained cleaning project could slow down the momentum of your company. If you’re a homeowner, you probably don’t have the time or the tools needed to get your space cleaned up to your standards. That’s where we come in. For more than 10 years, the professionals at CleanPro have specialized in offering extensive post-construction services. We use state-of-the-art equipment and a passion for perfection to tidy up after projects – small, large, and everywhere in between. Our goal, as your chosen cleaning service, is to ensure superior results while incorporating attention to detail and unparalleled workmanship. If you’re anywhere in Gloucester, Essex, Manchester, or any of the surrounding areas in Massachusetts, we would love to handle all of your post-construction cleanup needs. Contact us by using the form below, or call us!